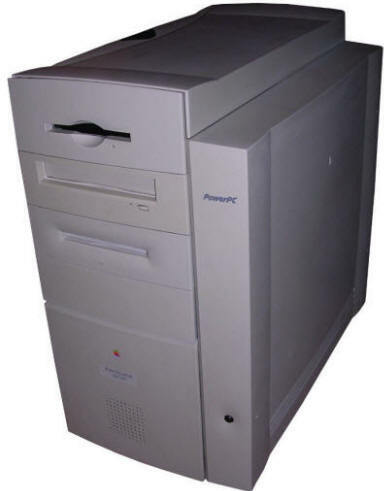 One of the fastest Macs before G3, runs on a PowerPC 604 processor clocked up to 350MHz (the 300 and 350MHz versions were released a few months after 200 and 233). A new tower casing with characteristic hollow space, designed cleverly for service and cooling, allowed to expand the system. Mainboard has PCI slots and supports memory in DIMMs, but in 5V EDO/FPM ones, not PC66/100/133. There were versions with different hard disk drives, but also with ZIP drive, and my unit has such drive. The 350MHz versions were quite rare as chips which could run stable at such high frequency were not easily available. Additionally the speedbump required another cooling solution, so there is a set of fans to supply continuous air flow. This was a professional machine, bought if G3 was not needed. Display: External, 15-pin connector in video board. My unit has enormous amount of RAM: 448MB, in six 64MB sticks and two 32MB, which were probably installed since beginning. It was used in multiple ways: As a server sharing a ISDN connection to company LAN, as a machine for storing some work and as license server for some colour matching and calibration software. Simultaneously someone had to do something on it as vector graphics packages were still installed. There was a lot of dust inside so it had to be kept running for a long time. I run Mac OS 9.1 - works well with such large amount of memory. Generally 9.x works well with all >64MB of RAM. Side cover can be removed by pressing a large, blue button in the top of it and opening it a few degrees downwards. It is not hinged, so don't open it entirely, only slightly to pull the cover upwards then to unlock it (see photo 4 in the gallery). Now you have a big fan there, so remember about it and don't clog it with cables. It also has to fit in its space, making contacts with its connector. To get access to the mainboard, place the computer on flat surface, on the side. Unlock two latches and open a whole top part towards the top of computer, make it sit on surface. If it opens more than straight angle - use an old book to keep it not broken off. Removing drives requires removing its front panel and then removing towards front. The installation of RAM DIMMs proceeds in the following order: A6, B6, A5, B5, A4, B4 and downwards. Usually B6 is closest to power sockets, goes to B1, A6, A5, ROM SLOT, A4, A3 etc. The only DIMMs it accepts are 5V EDO or FPM 60/70ns, 64bit, so no modern DIMMs here. If you blow RAM to the top like 512MB, it may take up to minute for memory test with blank screen. You can try to disable it by pressing Command-Option when opening Memory control panel. PCI slots... they are quite non-standard too. Order of boards is important. From the CPU slot, the first 3 are first, second and third slots from bus 1, next 3 are first, second and third from bus 2. More important boards usually go to first slots of bus 1 or 2, but in some units Twin Turbo video board may work only in the lowest, third from bus 2, slot. In some sound recording configurations, you need to put a mixer/output board in highest priority slot. 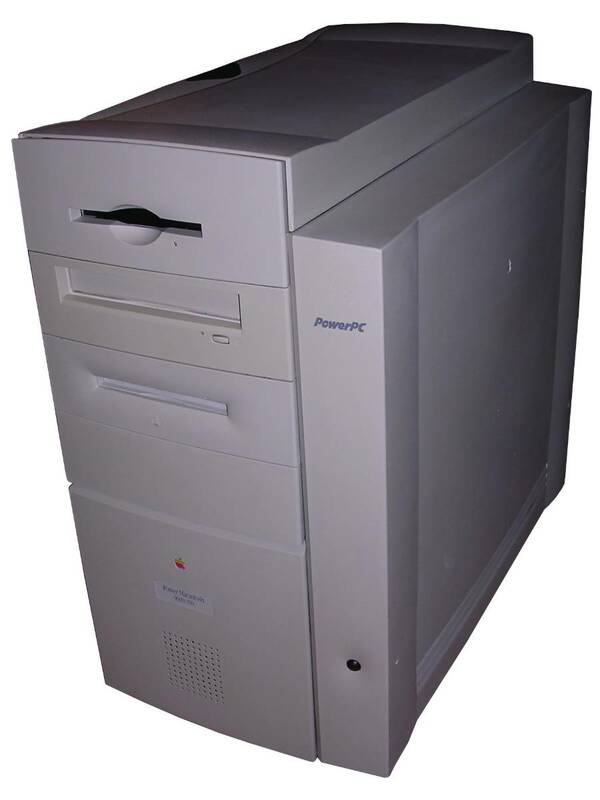 There are two versions of mainboard: One codenamed "Tsunami", a descendant of Power Mac 9500, and codenamed "Kansas" for 300/350MHz machines, being a modification for running PowerPC 604ev processor. Additionally Tsunami has a 512kB of cache soldered in, and Kansas has these chips in CPU. I have NOT tried this, but according to some sources, to run upgrade CPU boards (350MHz or any with cache) in Tsunami mainboard it is needed to disable cache by removing a 0-ohm resistor (link) called R31 located between RAM slot A1 and ROM chips. Twin Turbo 128 video board requires driver only in Mac OS 8.x, and not in all versions. 9.1 have these drivers built-in. http://web.archive.org/web/20060318204335/http://eshop.macsales.com/Tech/index.cfm?load=ixmicro.html - Drivers for IX Micro video board. http://web.archive.org/web/20070521221022/http://www.hermstedt.com:80/english/update/updateLeoISDN.html - Hermstedt Mac drivers, unfortunately some packages do not load, the ISDN OS9 Driver seems to load. http://web.archive.org/web/20031003203938/http://www.orangemicro.com:80/updateusb2mac.html - some software information, but no working links. Links for Mac OS 9.x point to typical Apple's USB updates which make the board work in USB 1.1 mode, USB 2 is only for OS X, drivers are for 10.1 and 10.2.
http://web.archive.org/web/20100102074620/http://xlr8yourmac.com/G5/G5_usb_firewire_reports.html - Information that this board works in USB 2 mode under OS X, and much more information about various USB boards for old Macs.